When this card is Normal Summoned: You can target 1 Level 3 or 4 WATER Fish-Type monster in your Graveyard; Special Summon that target in Defense Position, but it has its effects negated. You cannot S.. If you control no monsters, you can Normal Summon this card without Tributing. Once per turn, during your opponent's Standby Phase: This card's ATK becomes double its current ATK until the end of this.. Cannot be used as a Synchro Material. Up to twice per turn: You can target 1 Fish-Type monster on the field, then activate 1 of these effects. :- Increase its Level by 1. :- Reduce its Level by 1. You..
2 Level 5 WATER monsters. During either player's turn: You can detach 1 Xyz Material from this card, then target 1 face-up monster on the field; its ATK becomes half its current ATK until the end of y..
3 Level 6 WATER monsters. You can also Xyz Summon this card by using a Rank 5 WATER Xyz Monster you control as the Xyz Material. 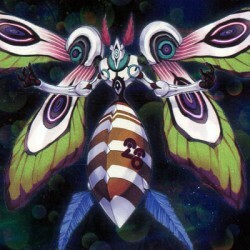 (Xyz Materials attached to that monster also become Xyz Materials on th..
3 Level 4 WATER monsters. You can also Xyz Summon this card by using a Rank 3 WATER Xyz Monster you control that has no Xyz Materials as the Xyz Material. This card gains 200 ATK for each Xyz Material.. If you control 2 or more face-up Xyz Monsters: Target the one with the lowest Rank (your choice, if tied); Special Summon 1 Xyz Monster from your Extra Deck, whose Rank is lower than that Xyz Monster,..
2 Level 7 monsters. If you control no other monsters, this card can attack directly, but when it does so using this effect, the battle damage inflicted to your opponent is halved. When this card infli..
2 Level 4 monsters. Once per turn: You can detach 1 Xyz Material from this card, then target 1 monster your opponent controls; banish it until your opponent's next Standby Phase. At the end of the Dam..
Banish 1 Tuner and up to 2 non-Tuner monsters from your Graveyard, and if you do, Special Summon 1 "Stardust" Synchro Monster from your Extra Deck whose Level equals the total Levels of those banished.. If you control a Fiend-Type Tuner with 1500 or less ATK, you can Special Summon this card (from your hand). If you attempt this, you cannot Special Summon monsters from the Extra Deck for the rest of ..
Target 1 monster in your Graveyard; Special Summon it, but it has its effects negated (if any), and if you do, immediately after this effect resolves, Synchro Summon 1 DARK Dragon or Fiend-Type Synchr..
1 Tuner + 1 non-Tuner monster. When this card is Synchro Summoned: You can Special Summon up to 4 Level 2 non-Tuner monsters from your hand and/or Graveyard in Defense Position, but they have their ef..
During your Main Phase: You can send 1 Zombie-Type monster from your Deck to the Graveyard. If this card is sent to the Graveyard: You can banish 1 Zombie-Type monster from your Graveyard, except "Goz.. If this card is Normal or Special Summoned: You can send 1 "HERO" monster from your Deck to the Graveyard. You can only use this effect of "Vision HERO Vyon" once per turn. Once per turn: You can bani.. When your monster declares an attack: You can target 1 Spell/Trap Card your opponent controls; negate the attack, and if you do, destroy that card. Each player can only Set 1 Spell/Trap Card from thei.. If you control a Level 8 or higher Spellcaster-Type monster: Banish 1 card on the field face-down. If this card in its owner's Spell & Trap Zone is destroyed by an opponent's card effect: You can Spec.. When this card declares an attack: It gains 600 ATK. During either player's turn: You can target 1 face-up monster your opponent controls; it loses ATK equal to this card's current ATK until the end o.. If you control a WIND Winged Beast-Type monster: Until the end of this turn, negate any monster effects your opponent activates. If you control a "Harpie" monster, you can activate this card from your..
During either player's turn: You can discard this card, then target 1 "HERO" monster on the field; it gains 2500 ATK until the end of this turn. During either player’s turn: You can discard 1 "HERO" m..